According to the astronomical calendar, spring started on 20 March. However, it wasn’t until a Saturday at the beginning of April – with the sun shining, birds singing, and flowers blooming – that spring finally sprang for me. 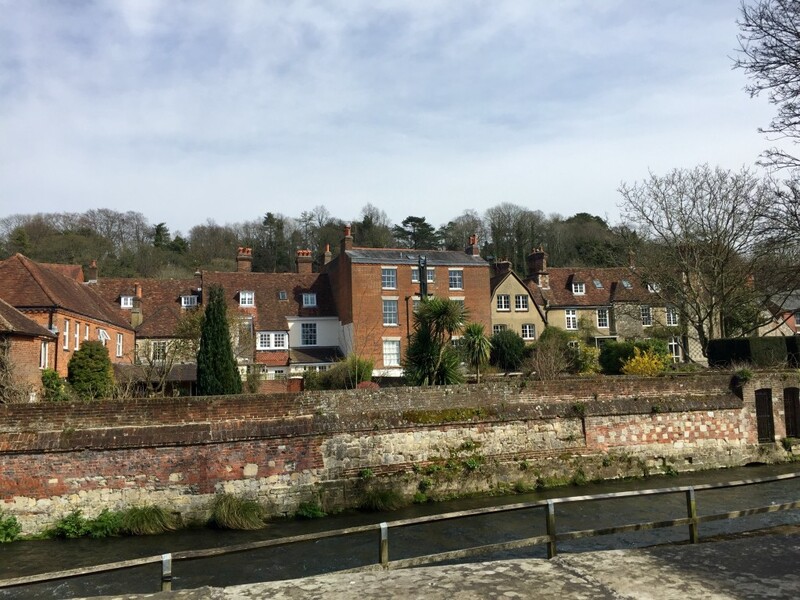 We took a walk into Winchester along the River Itchen from St Cross on the outskirts of the city. This is a great option if you want to get into town while getting some exercise and avoiding the hassle of parking. We left the car on Five Bridges Road. Before the M3 was finished in the 90s, this was the busy B3335, which led down to the A33 Winchester bypass. Now it’s a quiet and overgrown no-through road popular with walkers and cyclists. 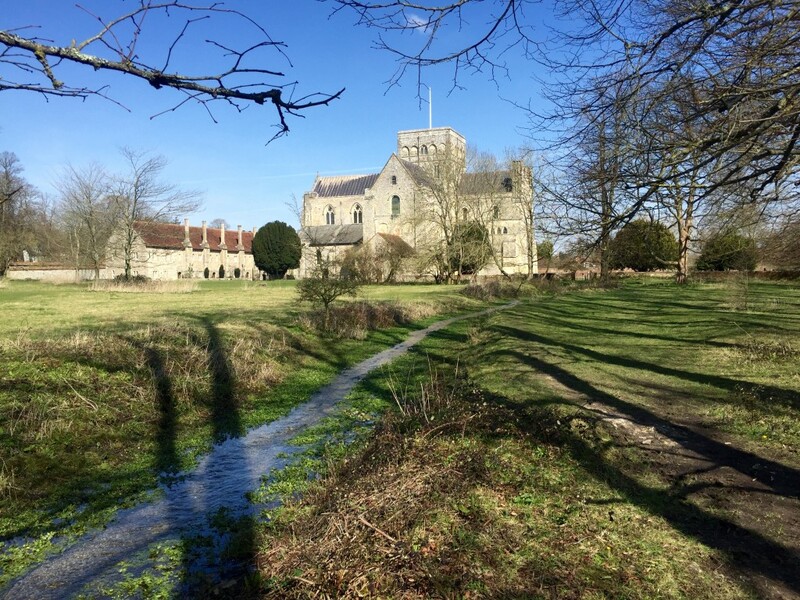 The first part of the walk took us beside a clear stream teeming with sticklebacks to the fields surrounding the Hospital of St Cross and its imposing church. The church dates from the 12th century and looks like a mini-cathedral. The hospital itself is an ancient almshouse that still provides accommodation for around 25 older men known as “the brothers”. William the Conqueror’s grandson founded the hospital between 1132 and 1136. But most of the almshouse buildings were constructed in the 1400s. 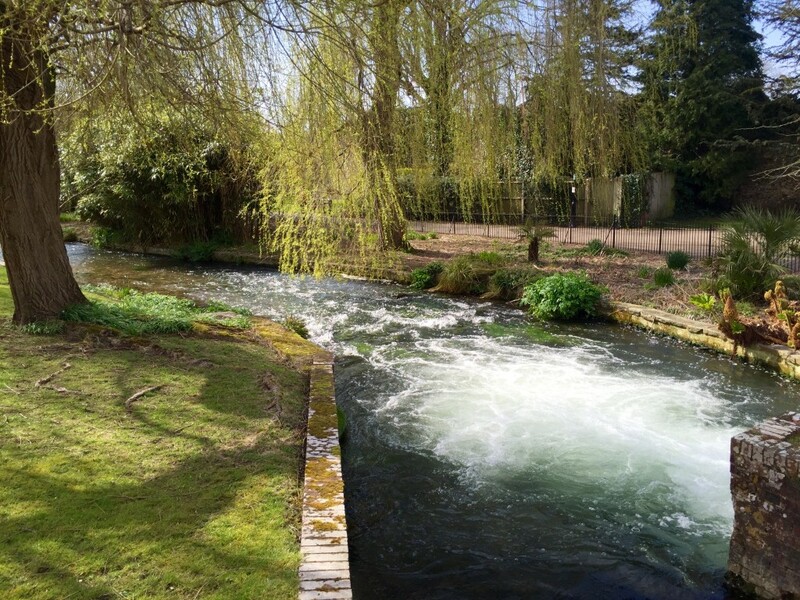 The River Itchen passes in front of the church. Here there’s a dog dip – also ideal for a summer paddle in the icy water if you’re brave enough (it’s blooming cold, all year round). The next part of the route follows in the footsteps of the poet John Keats. Keats visited Winchester in 1819 and walked between St Cross and the city every day during his stay. This was the inspiration for his poem, “To Autumn“. Anyway, back to spring… At the far end of the field in front of the church we headed to the narrowish path that continues in the direction of the town with views of the water meadows to the east. We then crossed Garnier Road and picked up the path that’s wedged between the river’s main channel and one of its many navigations. 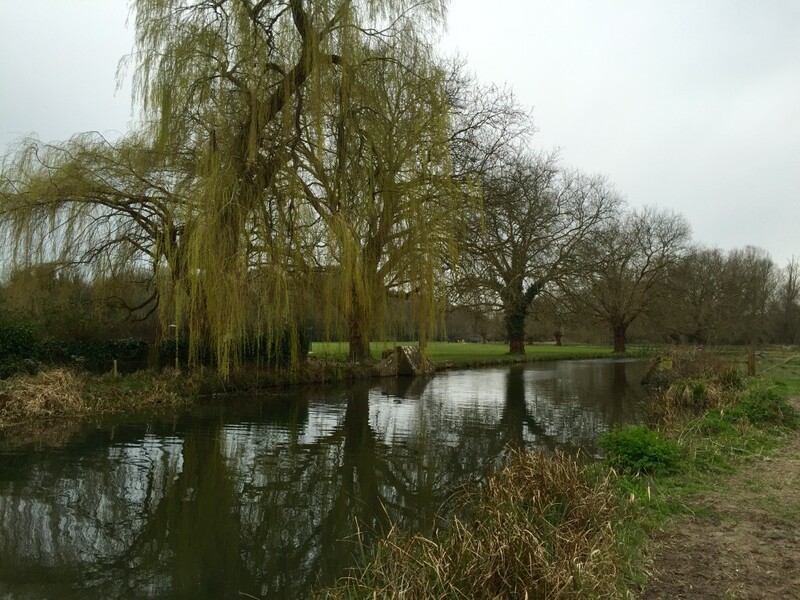 The sports pitches of Winchester College lie at each side of the water. The cricket pavilions provide the backdrop. 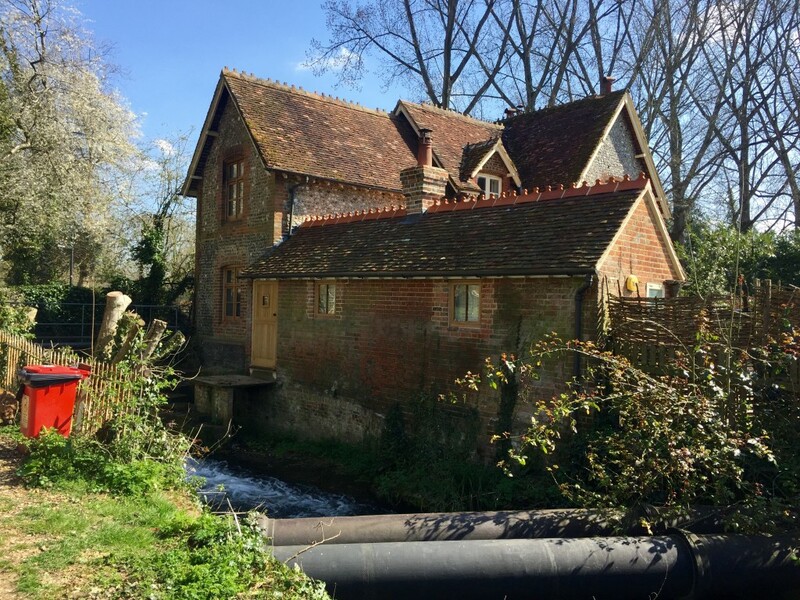 Come along here in the summer term and you’ll often hear the relaxing thwacks of a cricket match intwined with the sounds of running water. There was no sign of anyone on the freshly rolled grass today though. When we reached the city streets we headed up College Walk and onto College Street. 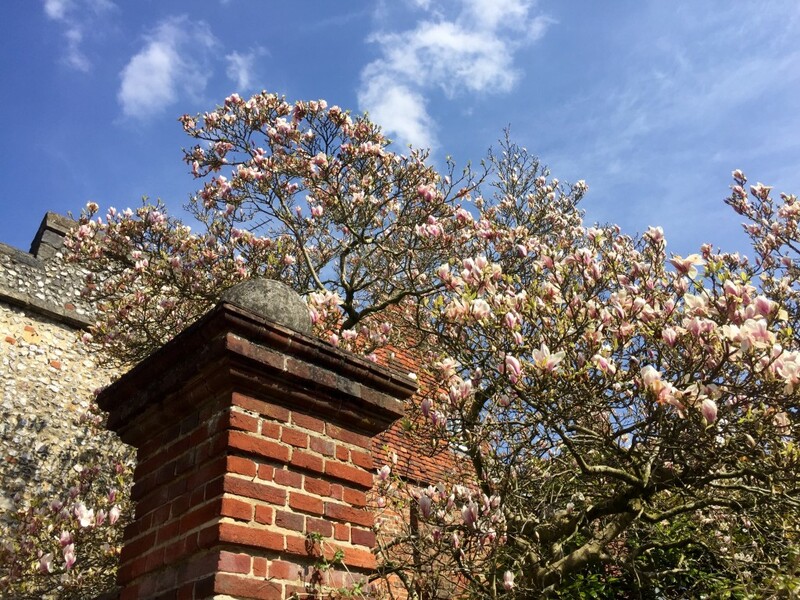 Trees laden with blossom popped up from behind the walls of the homes to our right as yet another reminder that spring was here. 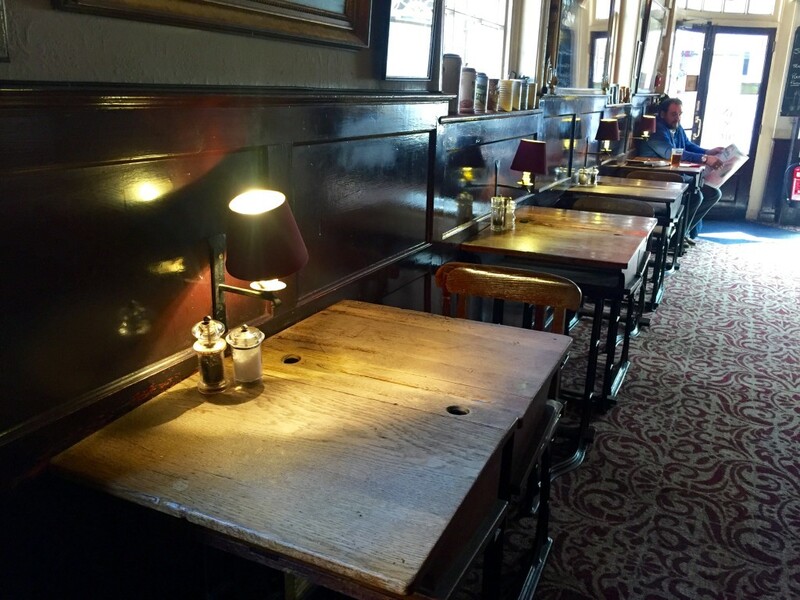 Despite it being a sunny day we couldn’t resist popping into the shaded confines of the dog-friendly Wykeham Arms on the corner of Kingsgate Street and Canon Street for a pint and a burger. This 18th century pub was recently crowned “Town Pub of the Year” by the Good Pub Guide and it’s not hard to see why. It’s worth a visit just to see the adornment of bric-a-brac on the walls and ceilings. Today it was nice to sit by one of the pub’s fires as we ate. Proof that despite the great weather it’s not quite time to dig out the shorts and flip flops. After lunch we bought of couple of postcards from the shop under the “Kingsgate Arch” – one of the gateways into the old city. I didn’t realise until recently that there’s a small church above this arch. The entrance is up a narrow staircase opposite the shop. We then turned right and under the “Prior’s Gate” and past the beautiful timber-framed Cheyney Court into the sheltered Cathedral Close. We learned a lot about this part of the city on our Halloween tour of Winchester last year. One thing to look out for is the remnants of a Roman tiled floor in the vaulted porch of the Deanery. It’s not hard to find – the Deanery second-hand book stall is housed in the porch on most days. Fortunately we didn’t run into the “Limping Monk”, who’s rumoured to haunt this area. When you’re a ghost who’s not so swift on your feet, I guess you have to save your efforts for dark winter nights rather than sunny April days. Next we passed through the arches of “Curle’s Passage” at the side of the cathedral and past its main entrance up to Great Minster Street where Tiff had a look round a few shops while I waited patiently with Tilly. Well, I say waited – Tilly dragged me from urine-soaked pillar to urine-soaked post for a sniff around. Winchester’s High Street was bustling as usual. 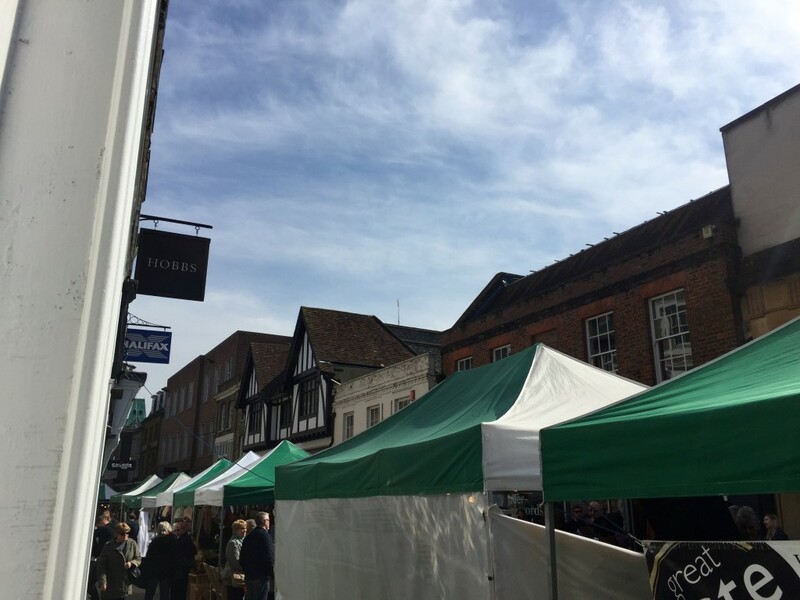 Saturday is one of Winchester’s several market days. Apparently, local shops have complained to the council that the market stalls are affecting their trade. And, I can see where they’re coming from. It’s nice to have a variety of extra traders to browse. But the street feels too darn claustrophobic and its easy to miss the many great shops hiding behind the canopies. There’s a nice atmosphere though, aided today by the great weather. At the bottom end of the high street under the shadow of King Alf’s statue Tiff popped into Chococo for a takeaway drink. Chococo’s hot chocolate made fresh with real chocolate never disappoints. Nor does the free handmade chocolate that comes free with every hot drink. We then skirted the Abbey Gardens to use the posh public toilets (there’s a classic music soundtrack as you “go”) and headed right down Colbrook Street. A few yards down this road, you can cut through to the river through the small “Scott Garden” and that’s what we did today. We relaxed for a bit on a bench to enjoy the sunshine and prep ourselves for the inevitable excitement that accompanies walking Tilly along the fast-flowing river – she has a problem with the ripples in the water, apparently. To be fair, Tilly behaved herself (just about) as we made our way along the paved river path known locally as “The Weirs”. 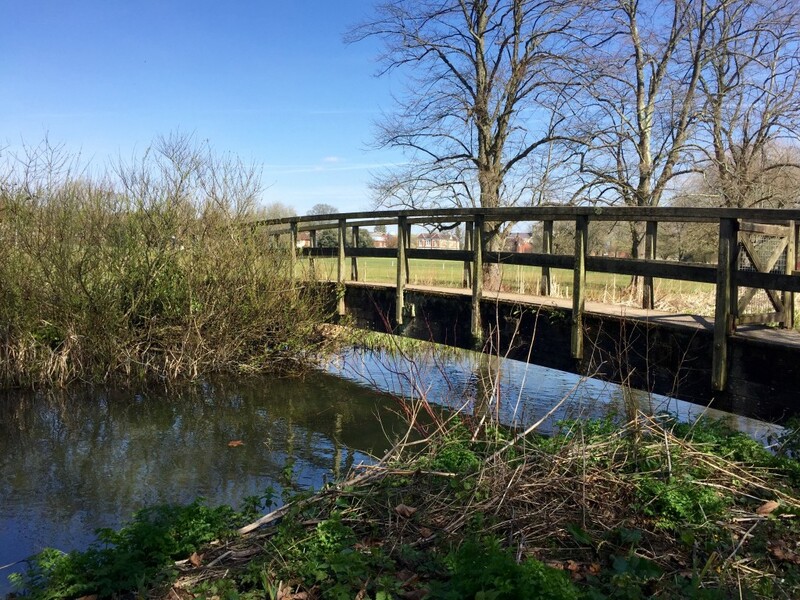 This is part of the “Viaduct Way” walking and cycle route, which runs from the city centre out to the newly restored Hockley Viaduct on the former Didcot, Southampton and Newbury Railway. Our next stop was the Black Boy pub. This is another interesting hostelry. It’s popular with locals and tourists alike thanks to its quirky decorations and ornaments, which include false teeth set into the walls, a stuffed moose’s head and an old-stool Space Invaders sit-down arcade machine. The ever-changing beer selection – usually from local breweries – is great too. Today, I had a Red Cat “Prowler Pale” and, after a chance meeting with our old uni friend Hannah and her fiancé Geoff/Jeff, a bonus Bowman Ales “Swift One”. It was warm enough to sit in the pub’s cosy garden. When we left, rather than go back the way we came, we continued down Wharf Hill and picked up the Itchen Way footpath for a short while along yet another of the Itchen’s many navigations. 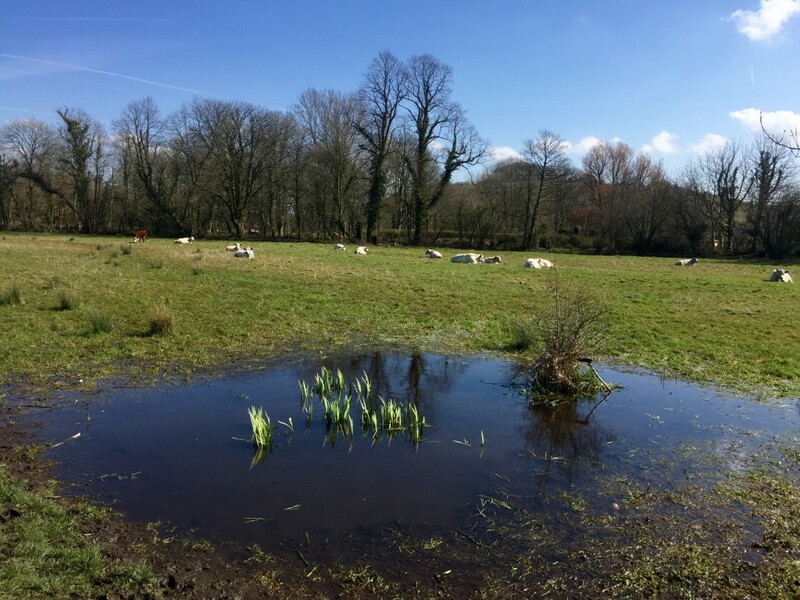 From here we were able to find a footpath that runs through some more water meadows and the college playing fields. We soon found ourselves back at Garner Road where we retraced our steps from earlier for the last mile or so, passing the Hospital of St Cross again before we returned to the car. By now, the spring weather had turned decidedly wintry again. I decided that the flip flops definitely aren’t coming out again just yet.